Scotland’s sparkling array of islands are well connected with ferry routes, and offer great potential for wild exploration and island hopping. There are around fifty inhabited islands situated off the coast of Scotland and almost every one can be reached by ferry. For the intrepid backpacker their ease of use, interconnected routes and numerous special tickets offer excellent potential for relatively cheap island hopping. Many ferries also offer free passage for bikes. In the interests of the pre-planning car holidaymaker, most ferries accommodate vehicles and offer opportunities for advance booking. In fact if you are travelling by car then it is advisable to book in advance whatever the time of year, and particularly if you are ferrying across the more popular islands. Despite the dazzling number of routes criss-crossing the Scottish west and north-eastern coasts, almost all the ferry services are the responsibility of just three ferry companies – Caledonian MacBrayne, Northlink Ferries and Western Ferries. Nevertheless during your adventures you may well encounter the countless small operators offering tourist day-trips to various islands. Most of the ferry boating services on the west coast are operated by Caledonian MacBrayne – or Cal Mac as it’s popularly known – a publicly owned company controlled and subsidised by the Scottish government. As a largely non-profit making operation, the service warrants financial assistance because it is a ‘lifeline’ service that plays a vital role in supplying the islands. Cal Mac ferries connect the mainland with twenty-two islands in and around the inner and outer Hebrides, via the ports of Oban, Mallaig and Ullapool. Oban links up with the more southerly destinations, Mallaig the more northerly, whilst Ullapool is solely responsible for connecting the far north-west Isle of Lewis with the mainland. Cal Mac also operates a service linking up the Isle of Arran in the Firth of Clyde. Ferry fares can be expensive particularly if you are travelling by car, and particularly if you plan to leapfrog between various islands. For this reason Cal Mac offer some special tickets for the more restless traveller. Its Island Hopscotch ticket offer reductions on pre-planned boating routes across the isles. The ticket is valid for one month and although you have to follow a set journey itinerary there are twenty-six set routes to follow. For example Hopscotch 1 offers passage to Cowal and Kintyre, whilst the much more ambitious Hopscotch 25 offers route encompassing Barra, Uists, Skye, Harris and Lewis. For those travellers who don’t want to be tied to specific routes and instead prefer to make up their journey as go along, Cal Mac also offers the Island Rover. This discounted ticket offers unlimited travel on any route in their ferry network for a set period. Remember though, particularly if you are a car traveller, that you still need to make reservations for the busy routes. The Island Rover looks kindly on bicycles, which are allowed to travel for free. The two western ferry routes that aren’t covered by Cal Mac and its array of special tickets, are those operating between Gourock and Dunoon on the mainland and the inner Hebridean islands of Islay and Jura. These journeys are operated by Western Ferries. 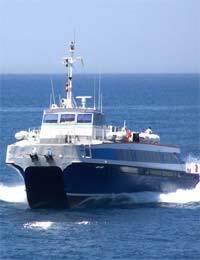 Since taking over duties from P&O Scottish Ferries in 2002, Northlink Ferries run mainland services to the north eastern isles of Orkney and Shetland. Connecting ferries depart from Aberdeen once or twice weekly and can take eight to 10 hours, or from Scrabster, near Thurso, a few times daily and take 90 minutes. The Orkneys are also connected to the northern outpost and tourist trap of John O’Groats during the summer season, in a service operated by John O’Groats Ferries. Northlink connects to the Shetland Isles via Aberdeen, although the long journey times – anywhere between fourteen and twenty hours – mean it is much more common for visitors to opt for the numerous air connections. The individual Orkney islands are linked by services provided by Orkney Ferries, while Shetland’s inter island service is run by Shetland Islands Council.